Posts Tagged With: where do the bluebirds go? Road to hell, and all that. I did say it might be hard to stay motivated on a steady diet of Juncos, Starlings, and squirrels. The good news is I’m de-slinged, starting PT and newly mobile! I can almost hold my binocs two-handed! The bad news is after a long mild run-up to winter, it’s finally gotten cold (though still not snowy) and the lakes have at last frozen over. So I missed the lingering migrating waterfowl. But I can start going on field trips again, huzzay! Dark-eyed Juncos remain consistently FBotD, with the exception of a Downy Woodpecker one morning. Goldfinches have begun to arrive in flocks of a dozen to twenty. I’m scanning them carefully for Pine Siskins which are starting to show up just north of here. I still hold out hope of seeing a Snowy Owl in this irruption season. If nothing else, one has been consistently hanging out at a shopping mall in Ithaca, so maybe I can negotiate a side trip when we bring Will back to school. Even though Eastern Bluebirds are year-round residents, in my mind I associate them with spring and apple blossom, so it’s always a sweet surprise to see a flock in the dead of winter. 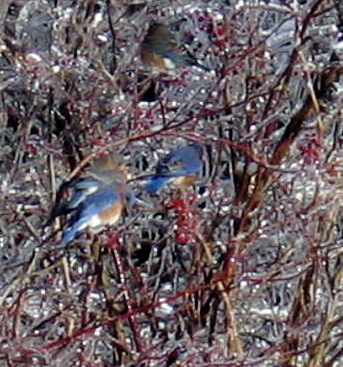 After the dreadful ice storm of December 2008 Randall photographed bluebirds foraging among frozen berries. I’d like to think my first Robins of the year are a sign of spring but that’s going beyond optimism to delusion. Dark-eyed Junco, Black-capped Chickadee, European Starling, Hairy Woodpecker, Downy Woodpecker, Red-breasted Nuthatch, Red-bellied Woodpecker, Tree Sparrow, White-breasted Nuthatch, American Crow, Canada Goose, Red-tailed Hawk, American Goldfinch, Mourning Dove, Blue Jay, Northern Cardinal, Tufted Titmouse, Eastern Bluebird, House Sparrow, House Finch, Song Sparrow, American Robin. 22 species, 2 new for the year. Got some catching up to do. Canada goose, Turkey vulture, American crow, Eastern bluebird, American robin, American goldfinch, Downy woodpecker, Hairy woodpecker, Red-bellied woodpecker, Red-winged blackbird, House sparrow, Blue jay, European starling, Eastern phoebe, Gray catbird, Ruby-throated hummingbird, Tufted titmouse, Barn swallow, Mourning dove, Northern oriole, Green heron, White-breasted nuthatch, Red-breasted nuthatch, Wood thrush, Cedar waxwing, Ovenbird. 26 species, 4 new to this list. We see more bluebirds in the winter than in the summer. During the 12/08 ice storm, Randall took pictures of a flock of a dozen birds looking for the last of the frozen fruit. Now that I’m noticing them, I’m seeing/hearing Cedar waxwings all over. Adirondacks albany pine bush backyard bird behavior bird calls bird food bird nest bird photos birds butterflies chaumont barrens chickadees christmas bird count cohoes come closer dammit I can't see your field marks ducks eggs feathers first of season five rivers floods flycatchers GBBC great blue heron gulls heat wave heron herps holy crap insects joy kestrel kestrel hill killdeer life bird! listy stuff mammals too mohawk river montezuma nwr month count nest material new to the list new toy NYS 2012 count NYS 2013 count osprey owls Papscanee postcard poems raptors road trip sandhill cranes sapsucker woods scenery shorebirds silly sky slow down dammit I can't see your field marks snow! snowy owl sparrows squirrels: the enemy stormy weather thacher park tools of the trade upriver very cute birds vischer ferry warblers waterfowl where do the bluebirds go? why? woodpeckers yard birds yay peregrines! What's happening on Kestrel Hill?